Watch related video by VOA's Michael Bowman. President Barack Obama and European leaders are threatening new sanctions on Russia after pro-Russian rebels launched a deadly rocket attack on the Ukrainian port city of Mariupol. 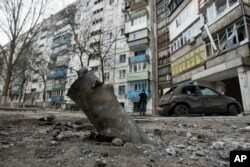 A piece of an exploded Grad missile is photographed outside an apartment building in Vostochniy, district of Mariupol, Eastern Ukraine, Jan. 25, 2015. Some European leaders have recently talked of easing economic sanctions against Moscow. But Donald Tusk, the former Polish prime minister who now serves as European Union president, tweeted in a message, "Once again, appeasement encourages the aggressor to greater acts of violence. Time to step up our policy based on cold facts, not illusions." Mariupol lies between Russia and the Russian-annexed Crimean peninsula. Heavy fighting in the region in the fall raised fears that pro-Russia separatists would try to capture the city as part of a push to create corridor that would allow Russia to access Crimea by land. Currently, it can only do so by air and sea. Rebels launched new attacks on Sunday against government positions elsewhere along the front line that winds through the two rebel-dominated eastern provinces of Donetsk and Luhansk, the Ukrainian military said. Meanwhile, Russian Foreign Minister Sergei Lavrov, speaking separately by phone with EU foreign policy chief Federica Mogherini and U.S. Secretary of State John Kerry, said Sunday that Kyiv's forces were responsible for increased fighting in recent days in eastern Ukraine. Lavrov told Mogherini Sunday that Moscow wants the EU to pressure Ukraine to negotiate with the rebels to implement a frequently broken cease-fire agreed to last September. Kerry told Lavrov that the U.S. was ready to participate in serious efforts to settle the conflict, but made clear that "Russia will be judged by its actions and that the costs to Russia will only increase if attacks continue," the State Department said. After the Mariupol attack, Poroshenko vowed to protect Ukrainian territory. He cut short his trip to Saudi Arabia for the late King Abdullah's funeral to chair an emergency meeting of Ukraine's security council. Poroshenko spoke about the situation in a telephone call Saturday with U.S. Vice President Joe Biden, who condemned the attacks, saying they were "initiated by Russia-backed separatists." The two officials also "expressed grave concern over Russia's blatant disregard for its commitments under the September Minsk agreement and unilateral escalation of the conflict, and agreed to work with international partners to ensure that the costs continue to rise on Russia for its aggressive actions against Ukraine," according to a readout of the call published by the White House. Ukraine military spokesman Andriy Lysenko said Sunday rebel shelling had killed an undetermined number of civilians and damaged 60 residential buildings in Mariupol. He said there was no electricity or heat in the city of 25,000 people.